If you have received an Irelandhotels.com Gift Card, a Gift Card Code number is associated with this voucher. Go to the Irelandhotels.com homepage or Call the Reservations Team here at 1890 87 67 69. Search through our wide vairety of hotels, guesthouses, offers and follow through to the booking process as normal. Once you have completed step 1 of the reservation (entering occupant numbers and lead guest name) you will be taken to the booking form. Fill in the booking form and enter your gift card code where highlighted below. 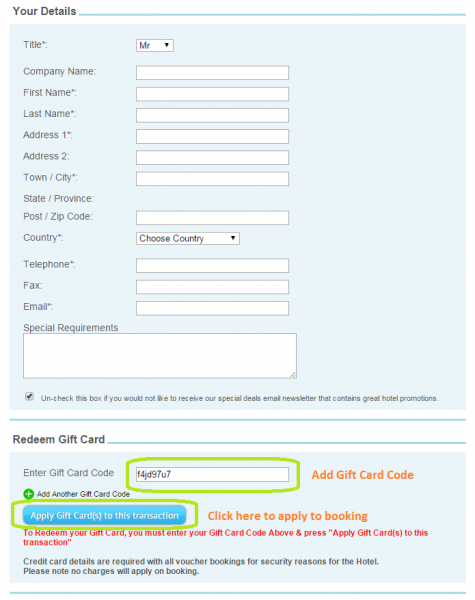 You must then click "Enter Gift Card Code" for the value to be deducted from your total booking value. *Note - Even if your gift card value covers the total booking value, you will need to enter credit card details as a security backup for the hotel in question. No charges will be deducted from your card here.